Josh – we received this (Koa set) yesterday. It looks great! I’ve been out of town for a few days. I was able to pick up the package yesterday. The wall art is just beautiful! Thanks so much for including the template. I can’t wait to install! Gorgeous islands! Josh was extremely helpful, answered all my questions and always responded in a timely fashion. This was quite a splurge for me, but I’m so glad I did it. Cannot wait to get to our new house and get them hung up! Amazing work. Absolutely love the islands. The template was very thoughtful and simplified hanging them immensely. Thank you! Item arrived on time and is great. The hanging directions are really easy to follow. The wood detail is really amazing and looks fantastic hanging on our wall. Thanks! This is an excellent product that I recommend as a unique wall art. The seller quickly answered all of my questions and the product was shipped out within a week. Very happy with the construction, design and application of these Islands. I simply followed the instructions provided and it was very easy to hang. I can’t say enough good things about them. Thank you again. So beautiful and so easy to install. Love it! Quicker receipt than expected. Quality purchase, simple detailed instructions. Great addition to our theme – Looks Awesome! Thank you!!! I freaking love this! Hawaii is my most favourite place for vacation so I’m very happy to have this in my house. The quality is great and I love how it mounts on the wall. Perfection! Josh was very helpful in helping us choose the right metal. We were very happy with our purchase. Very detailed work and well packaged. Thank you! Everything was awesome from finding the islands to receiving to hanging. The website is very detailed about sizes you will receive. We saw many of these metal casted islands while we were there over past several years, but we’ve never wanted to pay the $1000 being asked by the artists for their work. Josh’s metal work is well done, shops exactly as described, and hangs very easily with magnets. I am so pleased! We have a little of our favorite islands back with us in a Texas! very nice quality! exactly what I was hoping for. Thank you! This piece means so much to my family and I… we placed it right next to my dads urn. He would’ve loved it! Islands are beautiful! Can’t wait to hang them in our new home. I highly recommend this vendor!!! absolutely astoundingly beautiful. Thank you so much – I can’t wait to gift it for our fifth wedding anniversary next year! The workmanship of this map is incredible! Josh was wonderful to work with, and the template he provides makes hanging the islands super easy. It was the perfect completion for the wall above our TV. One of the best things I have ever purchased on Etsy! This template was perfect for helping to see if the Island Chain Artwork would fit our chosen location. Fast delivery, exactly as described. Easy to use. Very small purchase but definitely worth it. We actually found a new location that worked better because of the template. Islands look great, can’t wait to get them on the wall! Josh was very easy to work with: responsive, flexible, and informative. All that, plus high quality work, delivered on time. 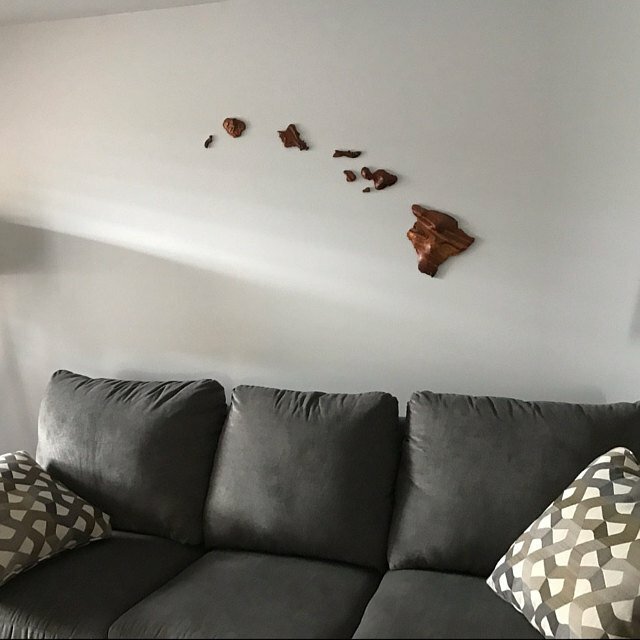 Ordered the Cast Copper Hawaiian Island Chain to display on my wall at home. I ordered it during this past Holiday Season 2016. When I opened the box, the islands were damaged. I contacted Josh and explained what I received, he was very responsive and acted quickly to help. Josh’s work is outstanding and I recommend to anybody who wants a chain of the Hawai’ian Islands is to get his work! Thank you very much Josh! I love my Hawai’ian Islands! Amazing quality craftsmanship. I highly recommend this vendor!!! Thank you!! Thank you!! Thank you!! We love the islands. I appreciate your hard work in getting this done before Christmas. It looks fantastic. Loved it!! Thank you so much! Josh has very good communication and is willing to work with any requests you can throw at him. The island chain I purchased is stunning, the attention to detail and quality of the items makes them well worth the purchase price. Would recommend using Josh for your purchase. Mahalo for your outstanding work and craftsmanship. Josh, we opened the package yesterday and i have to say, everyone in the room was blown away. What a fantastic job you did, the craftmanship is fantastic. This is truly a piece of art and will be treasured for years to come. I bought this for my husband for our 5 year wedding anniversary. (We were married in Maui.) I loved it. More importantly, my husband loved it! I totally love this art works, it is really beautiful ! Great communication, Can’t ask more about this seller. Josh did a great job and his work is on point! The 60 dollar Koa wood option is more of a shelf/desk top piece than a wall piece like the rest of his work, which isn’t what I expected, but I still love what I received. The quality and price are excellent! Joy and I love the koa islands and put these on the wall as soon as it was delivered. This made Joy’s birthday and our wedding anniversary very special. You do fine work. Thanks. Check out the pictures. I love the detail and design of this piece of art. Very happy with the service. Will be buying more art pieces in the future. The islands are of excellent quality and finish. The turnaround time and shipping was extremely fast and Josh went out of his way to ensure he met my timeframe. Thanks for a great experience! One word…..AMAZING! The workmanship is detailed and perfect. The hanging system was SUPER easy. Love, love, love it!!!!! The Koa Maui sculpture is perfect! It arrived wrapped carefully. It’s a beautiful addition to my home and provides a great conversation piece and loads of Maui memories. We had the most amazing 20th anniversary on the Big Island of Hawaii. We wanted something special to commemorate our trip. Josh’s Island Chain was it. We love Hawaii’s koa wood, however, Australia has such strict biosecurity rules, so we weren’t sure how we’d go with getting a wooden set cleared through customs. Josh worked with us and created a beautiful copper set that matched our needs perfectly. The magnetic fastening system makes it easy to take them down for discussion and then simply reattach. And they are topographically accurate, unlike many of his competitor’s sets that just have gouges and dings nothing like the real contours of the islands. He has thought of every last detail. Its wonderful to be able to liaise directly with the artist. He took great care in wrapping the island set for international shipping. We honestly can’t recommend his artwork highly enough– fantastic experience from start to finish. Thanks for being the icing on the cake to a special anniversary celebration! Just wanted to send along a picture of the island chain we installed in the hallway between our kitchen and the living area. We get to see it and enjoy it many times every day at this location. We are thrilled with the quality of the artwork and especially appreciate the dedication piece. Mahalo for working with us on this order. Please don’t hesitate to reach out if you have any ideas for which you’d like an unbiased opinion. Again, Mahalo for art that reminds us every day of the many vacations we’ve spent in Hawaii. Greetings Joshua. Our Island Chain package arrived yesterday and looks fantastic. Thank you very much! I just wanted to let you know how very pleased I am with your product. It is absolutely perfect. This is fantastic! The islands are represented beautifully with the Cast Iron… the look I wanted for my house. Hanging them is a breeze with the included nails and magnets on the backs of the islands. Also included is a template so that the spacing of the islands is exact! What a beautiful product. I am so happy with this purchase. I have been looking for years for this exact product! AMAZING! We just got our islands order and hung it right away. The template was perfect and helpful, and each island was center-weighted perfectly so they hung properly using the magnets! We love our art piece!! Koa Wood Hawaiian Island Chain Wall Set. Josh was really easy to deal with. When my package got lost he went over and above to make sure we got our islands. The Koa carved Hawaiian island chain I received was perfect! The craftsmanship was second to none! Josh was a pleasure to deal with. He made sure the gift for my sister got here before Christmas even though I was late in ordering it. I have seen others selling the same type of things on Big Island but the craftsmanship does not compare and they are twice as expensive. Hawaiian island Chain Art | Made from Koa and Mango wood. Absolutely stunning! 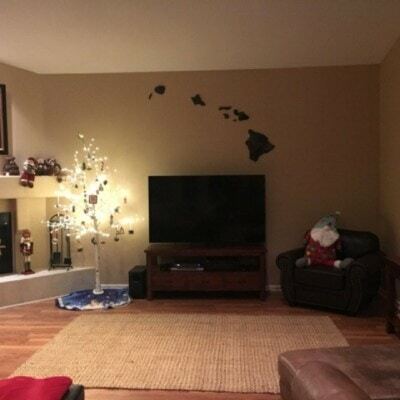 We lived on Kauai for a few years but now back on the mainland we wanted something in our home as a reminder of why we will one day return! The craftsmanship is incredible. Worth every penny. Beautiful work of art! I received it just days after placing my order. Josh has made me a very satisfied customer! I can’t wait to hang it! I’ve been looking for an island chain set for a long time, but never found just the “right” one. This is by far, the nicest I’ve seen. I love that this is handcrafted from Koa wood. The communication from Josh was always prompt and the packaging was excellent and well secured. I definitely suggest getting the magnetic set. I know between that and the wonderful template enclosed, hanging it will be a breeze. Many thanks, Josh for creating such beautiful art! These look great. Love the finish, and the koa wood is beautiful. The magnets are a neat, simple way to hang them nice and flush on the wall. I love this chain so much! It has Koa’s scent which is so nice! I hear that I am his first customer in Japan. It took about 2 weeks for him to make this chain and another week for me to get it. I was able to enjoy talking with him in easy English. I recommend Japanese people should order this beautiful chain to him. Dealing with Hamakua Wood Working was a pleasure. The Island Chain came quickly and as described. The detail is beautiful and we have received many compliments. It was worth the extra cost to have the magnets added and we greatly appreciated the island template that they included. Wonderful company and beautiful artwork! Great item! Beautifully produced. Delivered with all the necessary hardware (magnet version) and a template for proper positioning when hanging. I recommend the magnet version for ease of installation, etc. Wonderfully crafted and unique souvenir. Koa Hawaii Island Chain for Ginelle. Handmade with aloha indeed. This item is beautifully done. The woodworking craftsmanship is superb. We were amazed at the small details and awesome magnets sunk into the back of each island. Hanging them on the wall was a breeze. This Hawaiian Island Chain is beautifully carved and is a wonderful reminder of our Maui vacations. Josh answered all my questions quickly and my package arrived exactly when promised. Our Hawaiian Island Chain is a real conversation piece in our den with lots of debate over whether they are placed “just right”. Magnets in Islands were sure slick for hanging. Was a little concerned about the lack of a template, but looked on-line for a map and then used the rough guidelines on how much space the islands would cover to get map size using the wrapping paper. Put a dot where the island’s were, put homemade template on wall and just hammered nails through the dot and voila, perfectly spaced islands. I appreciated the service from Josh in ensuring the order was just right. Excellent value and less that half of the cost of buying similar carvings in stores on Maui. Spalted Mango Hawaii Island Chain Wall Set. Beautiful Island set. Amazingly accurate! Fits beautifully on the wall in my Den. Thanks for the great communication and beautiful work! Big Island of Hawaii made from Locally Grown Mango. I just received my Big Island in the mail! I absolutely love this piece and am amazed at Josh’s eye for detail! I can’t believe i found this amazing piece of art at such an amazing price! I will definitely be visiting this shop again in the future for gifts for others as well as myself! Thank you so much! Large Oahu Island Carving made with Mango or Koa Wood. a flawless transaction and a beautiful piece…thanks! We are so pleased with Josh’s work. 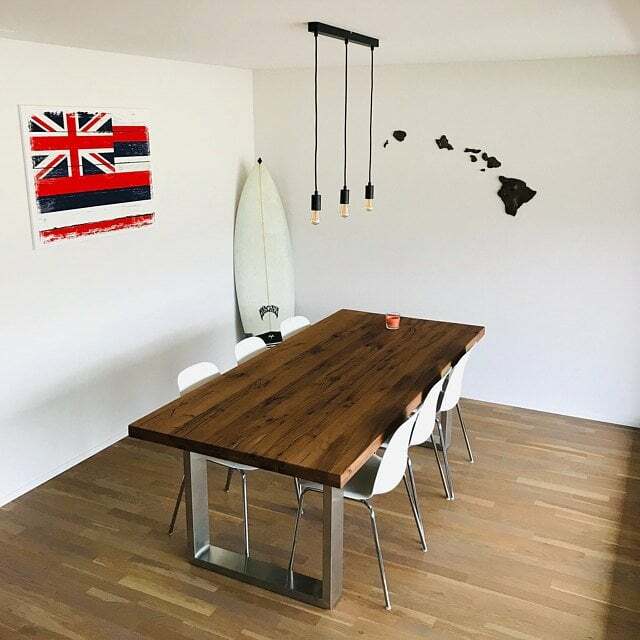 We purchased the large Koa wood Hawaiian Island chain wall art set after seeing a similar product in a shop in Whaler’s village for much more. He was easy to work with, was on time with the order and we absolutely love it! Unique and beautiful – a perfect edition to our coastal-themed home to remind us of our favorite place on earth! Beautifully woodworked and a pleasure to do business with this artisan! Delighted to have been able to make custom requests as well, thanks very much! Great customer service. Item was as expected. Looks great. I even got to see a picture of the completed item before it was shipped out. Seller wanted to make sure I liked the way it looked. Beautiful koa! Will look great on the wall. I purchased a Hawaiian Island set in mango wood from Josh as an anniversary gift for my husband. Josh was great in communicating through the process, even sending me photos of the work in progress as he custom made the set. He shipped it quickly and with insurance and tracking. Once I received the set, I was so happy with my decision to purchase this from Josh. He is a true artist. The detail of each island is fantastic. I see this as something that will be in our home forever, no matter where we live. This is a true work of art and a great keepsake. Thank you so much, Josh! Worth every penny! Purchased a single big island piece from mango wood. Product was beautiful and shipping was super fast! Couldn’t be happier. The magnets are genius, hanging them is a breeze. 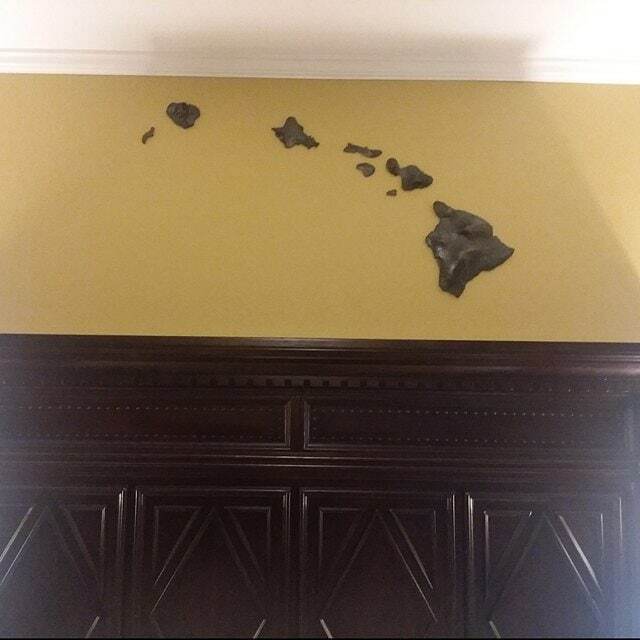 Used my computer/projector to put a google map of Hawaii on the wall and thumbtacks and got a perfectly geographically correct piece of art. Beautiful! I love the topographical detail. The magnets for hanging is brilliant.